The primary delusion of mankind is our inability to see things the way they really are. Because of a subtle willful blindness we see things in a distorted way. The world is in fact a seamless dynamic unity, a single living organism that is constantly changing. Our minds try to chop it up into separate static bits and pieces, which we then try mentally and physically to manipulate. This isn’t to deny that the notion of an “I” works in the everyday world. In fact we need a solid stable ego to function is society. But “I” is not real in an ultimate sense. It’s a name: a fictional creation that bears no resemblance to what is really the case. Because of this all kinds of problems arise. Once our minds have constructed the notion of “I”, it becomes our central reference point. We attach everything to it and identify with it totally. We attempt to do what appears to be in it’s best interests and defend it against threats and menaces. We look for ego affirmation at every chance to confirm we exist and are valued. The preoccupation arising from all this absorbs us completely, at times to the point of obsession. However this is a narrow and constricted way of being. Though we can’t see it when caught up in a fit of ego, there is something in us that is larger and deeper; a whole other way of Being. Reposted from https://hipmonkey.wordpress.com/2014/03/28/i-am/ in an off hand way …. This entry was posted in Uncategorized and tagged Being, bits and pieces, ego, I, reality, unity, universe. Bookmark the permalink. Love this, David, LOVE it! 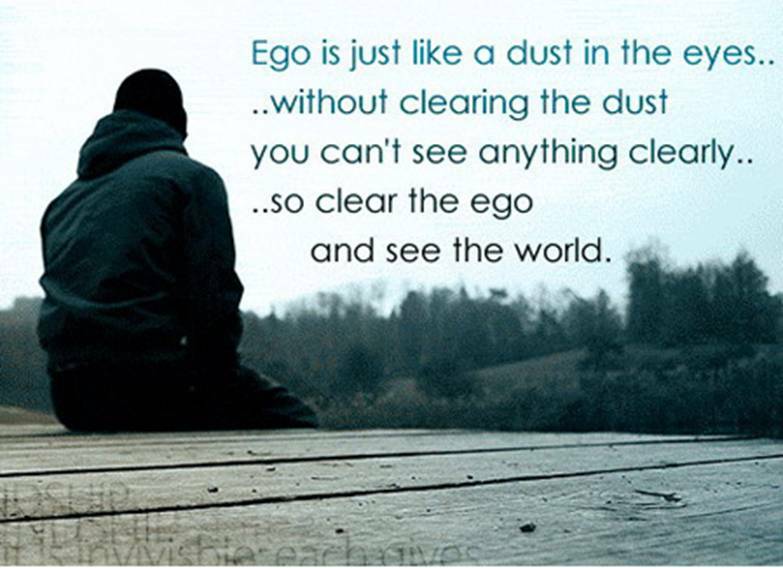 Astonishing how the three-letter word “ego” represents such a huge aspect of life. Some health problems have cast a whole new light on this “I” question. Ever since being diagnosed with clostridium difficile in 2012, I’ve become acutely aware that a lot of personal traits I thought were “mine” are directly related to my microbiome (my intestinal bacteria) and whether they’re in good shape or not. The only way to get rid of c diff is to colonize a new set of intestinal bacteria. I’ve been on a special diet to facilitate this since last November. However my new bacteria are incredibly fussy about what I eat. If I don’t eat the foods they like, I don’t sleep, I have no energy and I’m depressed and incredibly grouchy. When I eat the foods they like, I feel great with tons of energy. I’m also very generous and easy to get along with. How odd that so many personality traits I claimed as “I” had nothing to do with my own brain or consciousness – but were all down to the bacteria that live in my intestine. Fascinating discussion, Dave. We are all so interconnected to each other and the energy within and around us – it’s impossible to really understand who we are in isolation – and why do we feel the need to? Alan Watts calls our ego an hallucination, not a real entity but a construct made from assumptions of what we think of ourselves and what we believe others think of us. I agree with him that our ego is a fictional image. How it came to this is anyone’s guess, but I do feel we will eventually evolve into a better state of Realness. Great post… I agree with you whe you say that we have built the idea of I through our minds. And that dreams themselves are a dream”. I hope to make some posts soon, been very busy at home with other stuff ;) Thanks!! !